Intel's already fab'ing ARM chips (http://www.anandtech.com/show/7473/intel-to-fab-al... and they used to own StrongARM and still owns some XScale families. Intel has an arch license for ARM, so they can join the market with a lead over ARM quicker than we would suspect. Intel's fab "advantage" is smaller than most people are led to believe... since 65nm they have been doing what TSMC/GloFo/Samsung are doing now. GloFo and TSMC 28nm compete with Intel's "22nm" in density quite well, while losing in other areas... but, those other areas are likely due more to finFETs. That leaves Intel with a product they cannot sell for margins close to what their current lineup sells for, while also having to pay the same for fabs (mostly fixed costs) with smaller chips resulting in them utilizing even less of what they have. Intel is not going to join ARM. They failed before and they would fail now. Why do you think they sold Xscale? Because it was going so well for them? If they join ARM that would send a strong indicator to the market that they're "dumping" x86 (whether they admit to it later or not) - and then it would become a self-fulfilling prophecy and everyone would dump x86. Intel does not want that because their big profits are in high-end x86 chips (at least for now). Fujitsu LOOX F-07C already does this with the atom. It dual boots Window 7 and Symbian. Nothing furter from the reality. You forget amd does NOT have the printing the chips problem. And ARM already provides the schematics for the cores with the licence. So all amd needs to do is optimise and slap in their graphics core and send it to the "printer". Intel however has to deal with the entire process not being a multiple design business model like the rest of the fab world it would be a huge organisational change... amd doesn't know about such problems... one fabber can't build it no problem go to another. This is overly simplified but it still holds true. As to expertise... you really compare arm to amd?? You really think that amd is not capable of building a much better arm then arm itself when designers with less experience like qualcomm and apple did it?? Are you on the moon?? 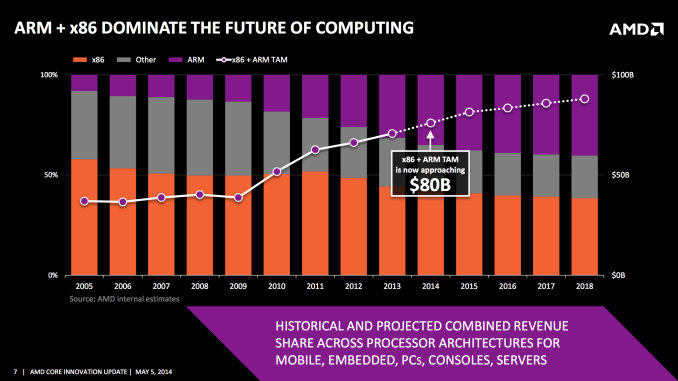 Amd has proabably the biggest chip design pattent portfolio in the world probably toppes only by ibm's research labs. To put it into perspective intel LEASES all the gpu patents from nvidia for a LOT of money. Amd doesn't need to. Amd has also loads of memory patents and many many others. So... what was your concern again?? That they can't build a 10x simpler chip then any modern x86 chip... you are really ... really funny. Both intel and amd can build arm chips while half asleep drinking coffeeand shagging at the same time... the problem for intel is NOT design after given specs... but addapting the business model and theyr fab processes to support large variations in designs. If you will it's the transition from enormously long conveyourbelt assembly lines to small robotic assembly stations... they are simply not eqipped to do it the way tsmc, glofo and now samsung are doing it. 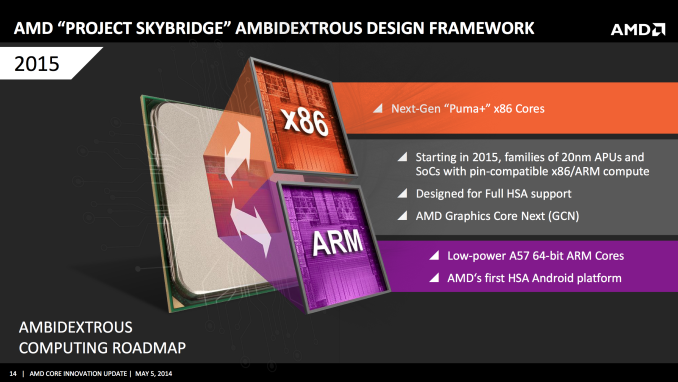 AMD has more experience fully designing CPUs than all companies in the ARM space to my knowledge. Well, perhaps less than ARM holdings. 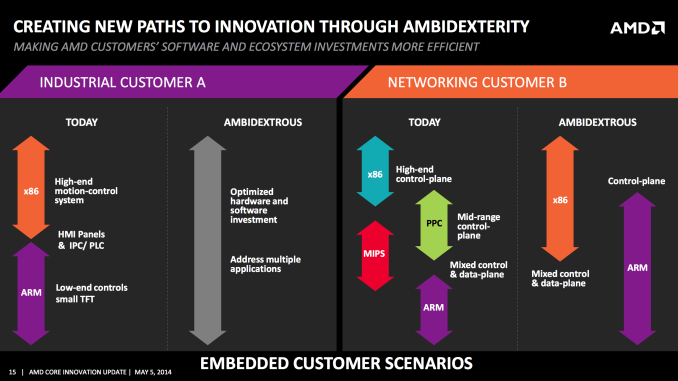 It really depends on if AMD takes a NVidia "just throw a GPU onto an ARM core" or the Qualcomm route "fully custom, aimed at low power" and, as we can clearly see, they choose the Qualcomm route.